If you covet your neighbor's sunroom, then ready-to-build greenhouse kits may be the answer. 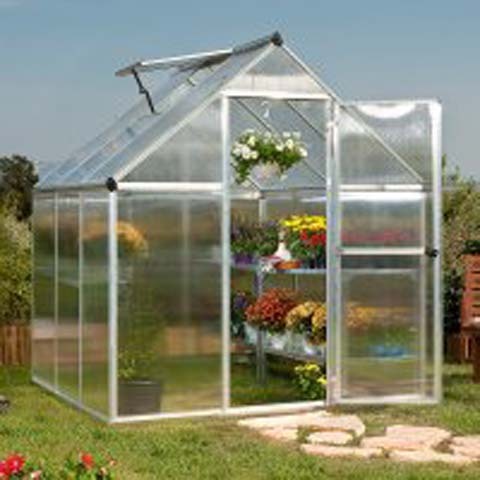 Today, there is a wide range of fantastic greenhouse kits—they are stylish and functional, and can be constructed from various economical materials. Greenhouse plans are another attractive option for gardeners on a budget. Greenhouse plans give you the opportunity to customize your design to fit your garden space. Before you start researching greenhouse kits or greenhouse plans, give serious thought to what you intend to grow and choose a structure accordingly. Your climate is also a factors. For example, if you plan to grow vegetables or flowers in a cold climate, a tightly sealed, double-walled enclosure is ideal. If you are interested only in seed starting, a plastic frame and siding with good ventilation may be all you need. Greenhouse kits range in size from 6'x8' to 16'x24', with all sizes in between. There are even balcony-size solar huts for small spaces. While there's no rule of thumb for the best size of greenhouse, experts will tell you that for the hobbyist, go for as large a structure a you can afford and fit in your gardening space. Greenhouse styles can be classic, featuring straight eves and gable roof, Victorian with curved eves and gothic arched roof, or rustic with wood frames. Frames for greenhouse kits can be redwood or cedar, galvanized steel, aluminum, or plastic. Plastic is popular with hobbyists because of the low cost and minimal heat loss. The siding determines the amount of light that reaches the plants. Glass is a traditional greenhouse material but it should be double or triple-walled to insulate properly. Plastics, such as fiberglass (usually a corrugated translucent material), polycarbonate, and polyethylene are shatterproof and good insulators. Have you ever wondered about the difference between a gazebo and a cabana? Here's a handy list of garden structure definitions.